Cumulus Villa is just a short walk from Lorient Beach, and was built with all the latest amenities in mind. It could easily accommodate up to five couples, and families are welcome. In fact, the villa’s bungalow was designed for children, with colorful decor and kid-friendly furniture. 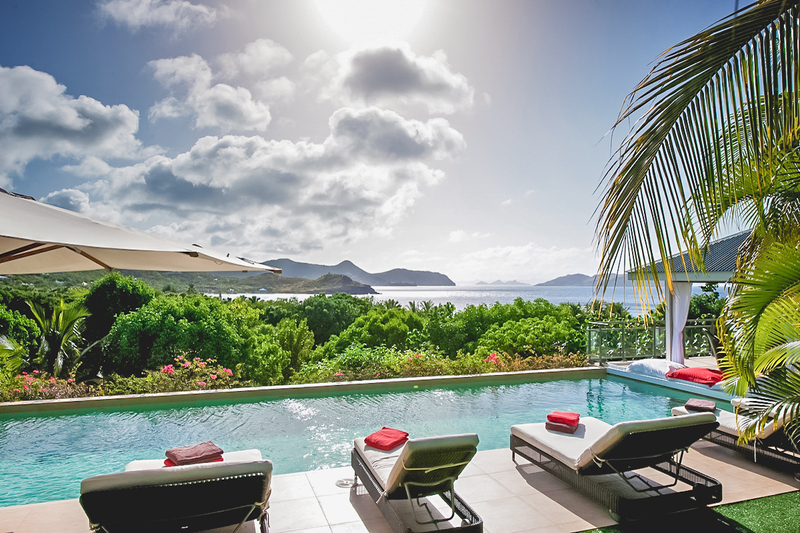 You’ll love lounging around the pool, the view is beyond dreamy! This is a non-smoking residence and daily maid service is included six days per week, excluding Sundays and island holidays. Perfect for families, great views! Cumulus Villa is minutes from reef-protected Lorient Beach, a quiet bay perfect for swimming and strolling. The villa offers two units, and one is designed for children. Outside, the terrace is surrounded by lush foliage that frames the ocean view. The 50 ft swimming pool is lined by the garden on one side, and loungers on the other. A dining gazebo sits at the head, ideal for sunset feasts. The covered porch shades the outdoor living area and an additional dining table. On the lawn, a large umbrella shades a circle of white armchairs. Take up a game on the pétanque court, or exercise in the fully equipped fitness room with an ocean view. Choose from a power plate, treadmill, upright bike, elliptical, incline flat bench, stretch trainer, free weights, functional trainer gym, gymnastics and exercise mats, and balance rocker board. The main villa holds the living room, kitchen, and three bedrooms, with full air-conditioning and Wi-Fi. The living room opens completely to the terrace, and is furnished with a flat-screen TV and Bose home cinema. The library is equipped with books and magazines, a phone, fax machine, photocopier, scanner, board games, Wi-Fi, chairs, and desk. The Italian gourmet kitchen is fully equipped with a breakfast bar, stainless steel appliances, and cookware. The first three bedrooms have king-sized beds, ensuite bathrooms, garden views, and flat-screen TVs. On the lower level, an independent apartment with its own kitchenette features a king-sized bed, TV, garden view, and an ensuite bath. The Creole Hut is perfect for children or teenagers, with two single bedrooms that share an ensuite bath. The cottage has a kitchenette and a living room with a flat screen TV, DVD player, play area, and docking station. This bungalow is a short walk from the main villa and gym, surrounded by gardens. Cumulus Villa is a 5 minute walk away from Lorient Beach, and several restaurants are within a five minute drive. Cumulus is ideally situated for convenience and privacy. 4 to 5 minutes walking distance.